As we look back in history, World War I ended, on the 11 hour of the 11th day of the 11th month. When I was checking FaceBook this morning there was a post from The Quilt Index reminding me of the significance of this date in history, along with a post of a quilt made in 1918. I'm reminded the "quiet" way women have played such a strong roll in our history by creating quilts to warm their families, give direction to slaves through the underground railroad, pass on family histories and love, oh, the list goes on. I appreciate this important piece history and how it has played in our lives and how it has evolved into elaborate traditional quilting and art quilts. I give great thanks to the pioneer women who passed down this tradition to their daughters and granddaughters. There is a history of quilters on Mom's side of the family. The picture above is of a quilt on my quilt rack. Two of my grandmothers' cousins made the blocks in the 1920's and then her step-mom (the only great-grandparent I knew) quilted it in 1966. After Mimi finished the quilting, it laid on my bed. My mom kept the quilt until my 40th birthday and then it became mine. Lucky me! I'm so blessed to be able to treasure this piece of family history and know the history of the blocks and quilting. When Mimi was quilting this quilt, the blocks were old enough that the fabric was thin and fragile. Mom asked why she was spending time quilting a quilt that was already in slightly poor condition, and the answer was that it was the best way to spend the day and to pass time. Today, I treasure getting to spend my days in my studio, passing time, continuing a family tradition of quilting, even though it is in art quilt form, not traditional quilts.Well, I periodically make traditional quilts, just ask my grandkids! Yesterday I spent a good part of the day dyeing fabric. 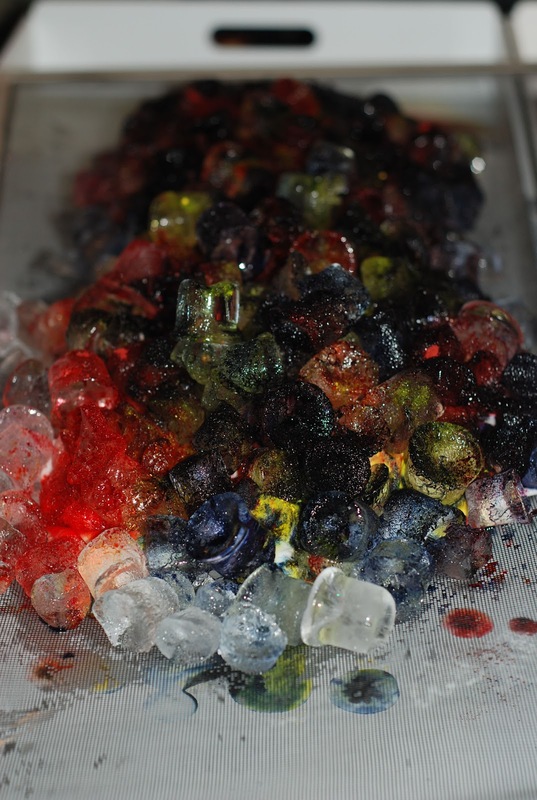 In the August/September 2011 issue of Quilting Arts Magazine, there is an article on Ice Dyeing. Oh yum! So yesterday I decided it was a great time to try it. Here are some pictures of the beginning of the process. 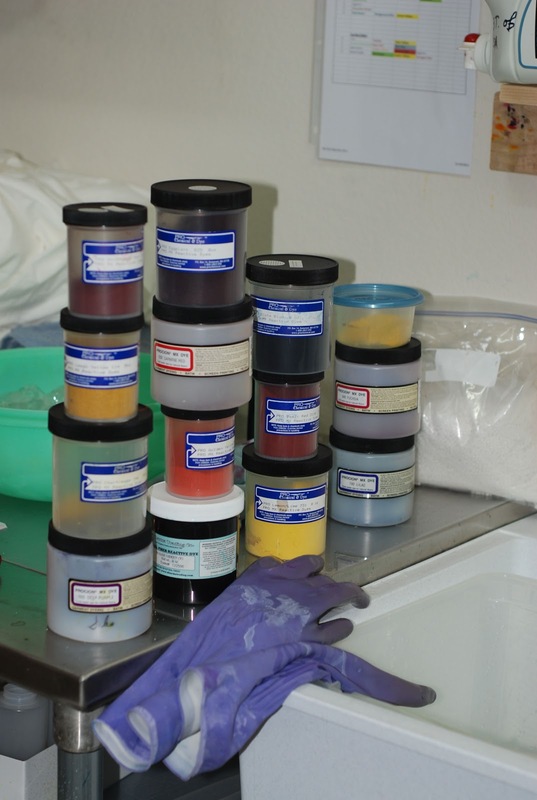 I selected my dyes and dyed 2 yards per color selection. I only had enough ice to dye two color selections, so I'll ice dye the other two tomorrow. Lucky for me, we have a nice under the counter ice maker! 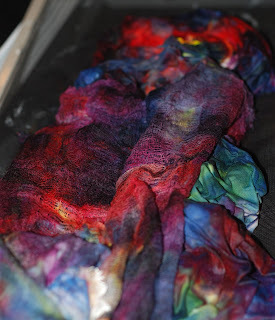 In the instructions it said to cover the fabric, ice and dye with a cover, well I used my favorite fiber, cheesecloth. I also put some cheesecloth at the end of the tray to sit in the dye run off. Can't wait to see how it all comes out in the wash later today. Here is a picture of the fabric and cheesecloth, the ice has all melted and is ready to start the rinsing and washing process. There will be pictures tomorrow of the completed pieces! Ice has melted and ready to wash! Love these colors!